I wrote the other day about Villanova’s defensive skill progressions. That was only one drill during a three hour practice. Villanova allocated time to a variety of fundamentals in their brand of basketball. Among the skills that Villanova emphasized in practice drills when I attended their practice were elementary finishes at the rim, pivoting with pressure applied, shooting game shots from game spots, defending pin downs, and of course shooting three pointers. After getting a rep from the right and left sides of half-court, players also got work driving baseline. They did finishes from both sides of the floor and both sides of the rim (so four total types of finishes). After each lay-up though, they always repeated the pivot work that simulated a rebound. Players were low and crouching as the coach or manager tried to pry the ball away. I asked Assistant Coach Mike Nardi about their footwork after practice. I had always been under the impression that players like LeBron and Durant pivot on one foot almost exclusively. He acknowledged this point, but he said players often do not have a choice as to what foot they pivot with on rebounds. The same could be held true based on the direction that players catch passes from. This skill was particularly vital in this practice as Villanova worked on defeating full-court pressure by v-cutting. That help explains why they were so meticulous in the way in which they drilled down their rebounding footwork. The next sequence of drills that Villanova incorporated involved them doing a variety of moves after a catch. In the first practice drill, they did a catch and shoot off of a small perimeter cut. Next, they went to a shot fake, one dribble, and hop step finish. 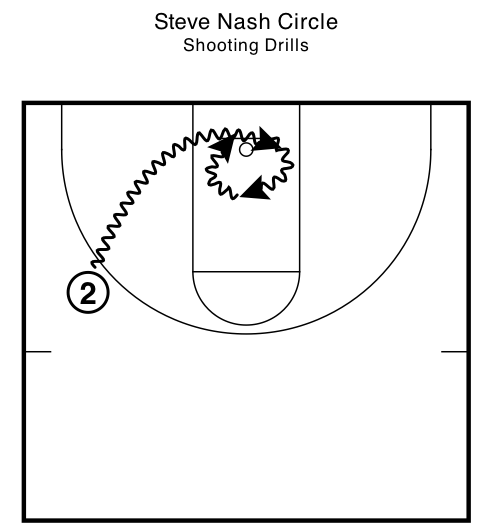 Third, they did a “Steve Nash dribble” (my term not theirs) around the key with a manager defender pursuing them. The players were relatively deliberate in the way they circled the hoop. It might seem unrealistic that this type of play would be a game shot in a game spot, but it is not (skip to 1:15). Defenses will not want to leave shooters on the perimeter to help, so guards with quickness mismatches as a result of switches can dissect a single defender in this manner and wreak havoc with bigger and slower defenders by drawing fouls. A fourth move the Wildcats used involved getting to the rim on one dribble and leaving off two feet. Jumpstops are a staple in the Villanova offense. Finally, they also incorporated some jab step moves to get off a jump shot. Trail the curl by getting your head lower than the screeners shoulder and your shoulders at their hip level. Person on the screener get below the screen to be in position to hedge and quickly recover. Be physical, but that’s a prerequisite for everything they do. Villanova knocked down a Final Four record 18 three-pointers against Kansas last season. In fact they tied the record for made three’s in just the first half. They made 50% of the threes they attempted in the 2016 tournament en route to their first title under Jay Wright. Collin Gillespie was quoted in a USA Today article by saying, “We’re taught to catch and shoot in any situation. Catch and shoot first, and if they start flying at us, shot-fake and drive.” It is that simple, and it is also backed up by the way that they practiced. At the start of practice, players did not sit under the hoop and take two foot shots. The moment they hit the floor, they were jacking up three’s. After practice concluded players stuck around and got up shots on their own. Again, they were focused exclusively on the three-point shot. In their shell drills, every offensive and defensive rebound led to a kick out to a shooter for a three. The offense of course passed to their team, and so did the defense.